The Fall 2013 AES show introduced a handful of fantastic new microphones. This recap of same is a bit delinquent, coming after the 2014 NAMM show, but serves both to highlight some worthy products, and to illustrate an interesting difference between these two trade shows: the AES convention brings out all the little boutique manufacturers, who most often are the ones making the most exciting gear. Take Oliver Archut, for example. He’s the design engineer behind a half-dozen microphone lines I could name, and he supplies transformers to even more. At the AES show, he was showing off two new mics under the Lucas Engineering brand (co-owned by Terry Manning). The Lucas Engineering CS-9 is an M7-based tube-and-transformer mic that owes its design inspiration to the Neumann M49. The capsule is from Thiersh; the tube from Mullard — the same exclusive tube from Lucas’ CS-1. The transformer is, of course, AMI’s. Oliver also introduced the long-awaited small-diaphragm Lucas mic, an omnidirectional tube condenser dubbed the CS-3. This is actually the first of two SDCs to come; the CS-2 will have a Cardioid capsule. Terry Manning tells me that building these mics with interchangeable capsules would require too many sonic compromises. By building fixed-pattern mics, Lucas Engineering can tailor both the case venting (which can affect polar pattern and frequency response) and the mic’s circuit to best complement the specific capsule in use. Oliver also had a hand in two new mics released by Stephen Bright’s Cathedral Guitars label. 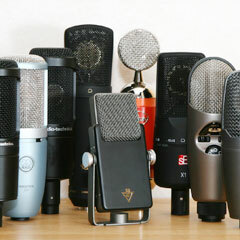 Both are vintage mic recreations, modeled after the Neumann U67 and the AKG C12. The Cathedral Guitars U 67 CG mic is based on a brilliant insight: that the current production TLM 67 is a physical clone of the U67’s body and capsule. AMI supplies a circuit, transformer, and power supply based on the U67; the result is probably as close as you can get to what a brand-new U67 would sound like. Note that Neumann owns a patent on the U67/U87 grille; any “clone” or “replica” mic with a different grille will necessarily sound a bit different from the original due to the differing acoustic properties of the grille. The Cathedral Guitars C12 CG uses AMI’s reproduction C12 metalwork (which had already been available as a kit), with an original brass AKG CK12 capsule refurbished by Klaus Heyne. Rather than the expensive point-to-point wiring of the original mic, the C12 CG uses a PCB version of the same circuit, with AMI’s T14-style transformer. If you think of the Schoeps brand, you probably think of their justifiably famous small-diaphragm Colette series of microphones. They’re among the best SDCs on the market, and they benefit from the company’s 60+ year history of research and development. So you’d have to imagine that if such a company wanted to build a studio vocal mic, it would be pretty interesting. With that in mind, I invite you to check out the Schoeps V4 U. The distinctive bottle style and tilting oblong head are borrowed directly from a vintage Schoeps tube mic. The circuit is transformerless, balanced, direct coupled, and low-noise. The capsule is — as you’d have to expect — a small-diaphragm design. But it is built into a beveled collar that was carefully designed to allow the small capsule to emulate the frequency-dependent directional sensitivity of a larger capsule. It is a premium mic (MSRP $2999) with a significant amount of engineering built in. And some very tasteful retro styling. Neumann’s TLM 107 drew a big crowd; it is (perhaps sadly) not every year that pro audio’s most venerated brand name introduces a new product. It is a mid-priced model (MSRP $1700) that combines some nice technical innovations with cost-conscious styling. An example of the former is the electronic joystick control for noiseless selection of pad (3 options), filter (3 options), and pattern (5 options). An example of the latter is the diecast body. I see the TLM 107 as a more neutrally voiced all-purpose studio condenser — something I’d personally reach for before the TLM 103 on most sources. I saw three more mics that bear mentioning: two new models from Ronin Applied Sciences (who wowed the prior year’s AES crowd with the very limited-production Pegasus tube mic), and a new premium ribbon mic from my pal Mark Fouxman at Samar Audio Design (whose MF65 is one of the finest ribbon microphones made today). Two of the very first Samar ribbons will be in my hand within 30 days for a deep evaluation. We’ll have a profile of this mic, and the Ronin mics, as soon as we can get decent photos and full technical details.